We all have flashbacks to our favorite foods of the past, which we have not had for a while, and the taste buds are longing for them. 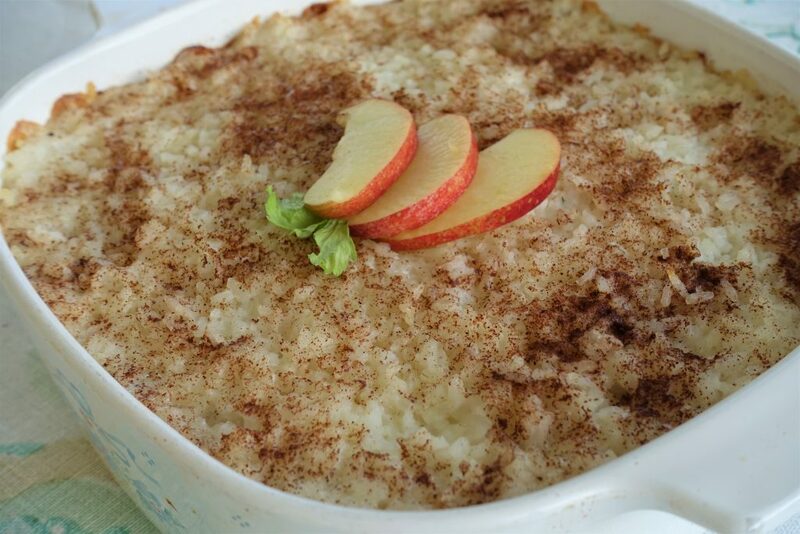 One of those foods for me is white rice baked with apples, sugar and cinnamon, which my mom used to make for us as a special treat on Sundays. It does not sound like much today, but then it was very special. Today I will share this recipe with you, in case you never had it before, and might like to try it. This is a delicious vegetarian dish as a snack, dessert, lunch or breakfast. Perfect cold snack on a hot summer day, or nice and hot on a cold winter day. Grease a 6 quart casserole dish with butter. Spoon 2 cups of the cooked rice into the casserole, and spread it evenly. Pat it down firmly. In a medium bowl, mix the apples with 1 Tbs of sugar ,1 Tbs. of cinnamon,and lemon juice. Spoon the apple mixture over the rice layer, and pat it down gently. Cover apples with remaining 2 cups of rice, pat it down. In a medium bowl, mix the milk, or cream, with the vanilla extract and remaining 1 Tbs. of sugar. Gently pour this mixture all over the rice layer. Sprinkle the remaining 1 Tbs. of cinnamon over the cream/rice. Preheat the oven to 375 degrees F. Bake uncovered for 30 minutes. Serve warm, or cold, with fresh fruits, jam, whipped cream, or your favorite syrup. I think it sounds awesome! 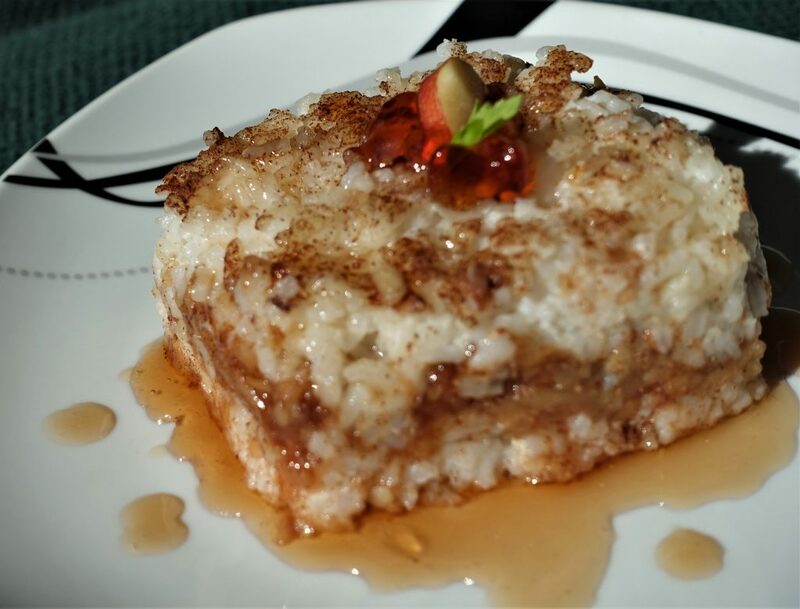 What a lovely way to use cooked rice.. My Mom used to make what was called a Snowball dessert with cooked rice. Can’t wait to try this recipe! Thank you for sharing. My grandmother made a somewhat similar dish using her own handmade baked noodles (kluski) instead of rice. It was delicious and very special. The next day, leftovers were reheated and served topped with vanilla ice cream. YUM! Making this tonight for our Wigilia. Merry Christmas a d Happy New Year. Sounds delicious to me as well. Thank you for your comments. That is wonderful. Glad I was able to post a recipe you will enjoy, as much as I do.